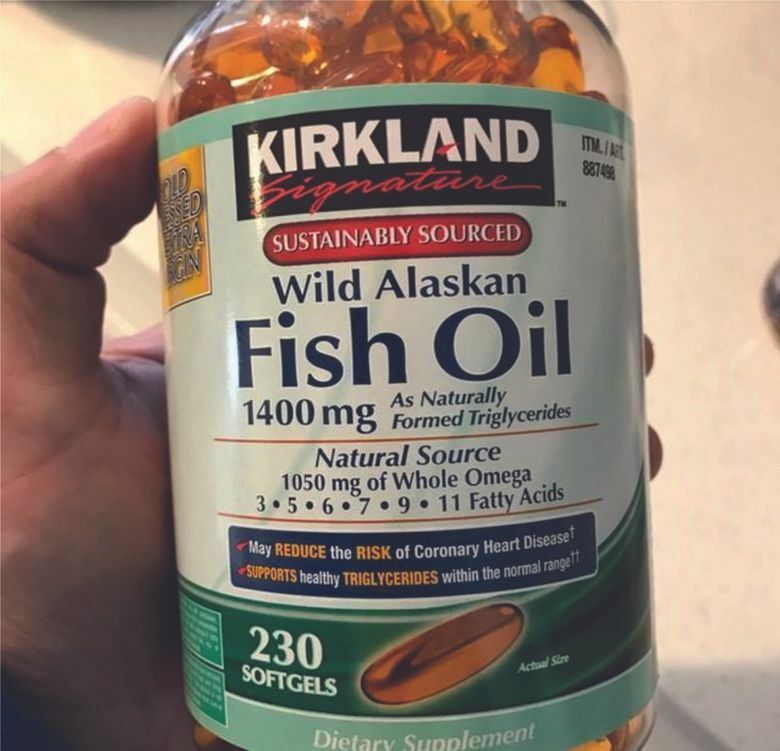 A lawsuit alleges Kirkland Signature Wild Alaskan Fish Oil, sold by Costco and made by Seattle-based Trident Seafoods, does not contain the promised quantity of omega fatty acids. Image of fish oil from complaint filed Feb. 27, 2018 in federal court in New York. A lawsuit claims a fish oil supplement sold by Costco and made by Seattle-based Trident Seafoods contains less omega fatty acids than the label says it does. The New York plaintiff is seeking class action status. Lawyers for a New York man who bought Costco’s Kirkland Signature Wild Alaskan Fish Oil sued the company and manufacturer Trident Seafoods this week alleging that the dietary supplement contains less than half of the sought-after omega fatty acids that the labeling claims. The suit, which seeks class-action status and was filed in federal court in New York City, claims the companies violated the Federal Food, Drug, and Cosmetic Act and state consumer protection laws. Neither Costco nor Seattle-based Trident Seafoods returned requests for comment Wednesday. Fish oil is marketed for health benefits such as lowering blood pressure, triglycerides and cholesterol, and maintaining cardiovascular health – claims that are not evaluated by the Food and Drug Administration, which does not regulate nutritional supplements in the same way it does pharmaceuticals. The complaint cites testing of the Kirkland Signature brand oil performed by Consumer Lab, a Westchester, N.Y.,-based company that evaluates health and nutrition products, and another analysis commissioned by lawyers for the plaintiff, Norman Leibowitz of Glendale, N.Y. The suit seeks to represent all New York residents who bought the supplement. Specifically, the Consumer Lab tests found only about 48 percent of the 720 milligrams of omega-5, 6, 7, 9 and 11 fatty acids listed on the label. The other analysis found only 40 percent of the 330 milligrams of the omega-3 fatty acids listed. The lawsuit doesn’t say how many bottles were tested. A 230-count bottle of 1,400-milligram fish oil supplements sells on Costco’s website for $19.99. The complaint includes a picture of a bottle of the supplement. Searching Trident’s site for the lot number on the bottle — as well as other lot numbers — returned no results. A similar class action suit naming Costco and Trident was filed in the same court a year earlier to the day by a different attorney. It was voluntarily dismissed less than two months later, before either company filed a response.